Why liberals loved to hate Antonin Scalia. Justice Antonin Scalia testifying before the Senate Judiciary Committee in 2011. He was probably unnerving some liberal senators. Here is one of the hardest things about losing Antonin Scalia: His views were often ugly and wrong, but the ways he expressed them were thought-provoking and stirring. He was the most three-dimensional justice with an often two-dimensional worldview. History will likely remember him as someone who was gloriously, powerfully on the wrong side of so many important questions. But history will surely remember him. As a liberal you are certainly free to hate Scalia, and sometimes it seemed he worked overtime to earn your hate. He gloried in it. He wrote cruel, demeaning things about whole groups of Americans—and even if you didn’t belong to one of those groups, Scalia was the fifth vote on what many of us consider towering historic injustices, from Bush v. Gore to Citizens United. For years and years, I told anyone who asked that the day the high court lost Scalia would be the day I quit covering it. On that day, which came Saturday, I knew the court was also losing everything dramatic and absurd and quotable, even as it lost its cartoon supervillain. What would be left when the man in full was gone? I won’t miss his mockery or the casual slights. In some ways he prefigured the 2016 election, with all of its finger-pointing, rage, and quick-on-the-trigger sound bites. Still, I fear that the court will be a less vivid, less passionate place in his absence, even as some of the most hateful of the court’s views will now perhaps be moderated. There are those who contend that it does not benefit African-Americans to get them into the University of Texas where they do not do well, as opposed to having them go to a less-advanced school, a less—a slower-track school where they do well. One of the briefs pointed out that most of the black scientists in this country don’t come from schools like the University of Texas. People gasped in the chamber. The Internet ate its head off for a few days, and Scalia made hay by doing what he did best—saying something that had been earnestly briefed and argued in the most inflammatory way he could muster. So rage all you want, liberal friends. Scalia invited and welcomed and celebrated it. Toward the end of his career, he bemoaned the bitter partisanship of Washington, without acknowledging that he was as polarizing as those he deplored for being polarizing. In that way too he set the stage for this election cycle and the ideological battle that will rage to fill his seat. If our next decision is meant to follow the course he set, we will reach out to him, and if we will not accept his direction we will have to grapple with him. But year after year, in subject after subject of the national law, we will either accept the inheritance of his thinking, or we will have to face him squarely and make good on our challenge to him. Whether you choose to think of him as a hero or a hater, a fully-realized ideological visionary, or a caricature of an arch-conservative, the same is true of Scalia. For years, the law and the other justices will shadow box with him, reckon with his vast intellectual legacy, and perhaps—if the arc of the universe indeed bends toward tolerance and fairness and generosity—eventually put him to rest. But give Scalia one more thing: On a Shakespearian court he was a Shakespearian figure. Nobody but Scalia could have written, airily, that “this Court has never held that the Constitution forbids the execution of a convicted defendant who has had a full and fair trial but is later able to convince a habeas court that he is ‘actually’ innocent.” To describe the execution of an innocent man as fully constitutional takes operatic levels of chutzpah. In my years covering the court, I ground my molars into dust most weeks, wondering how Scalia could make being so wrong seem so intriguing. 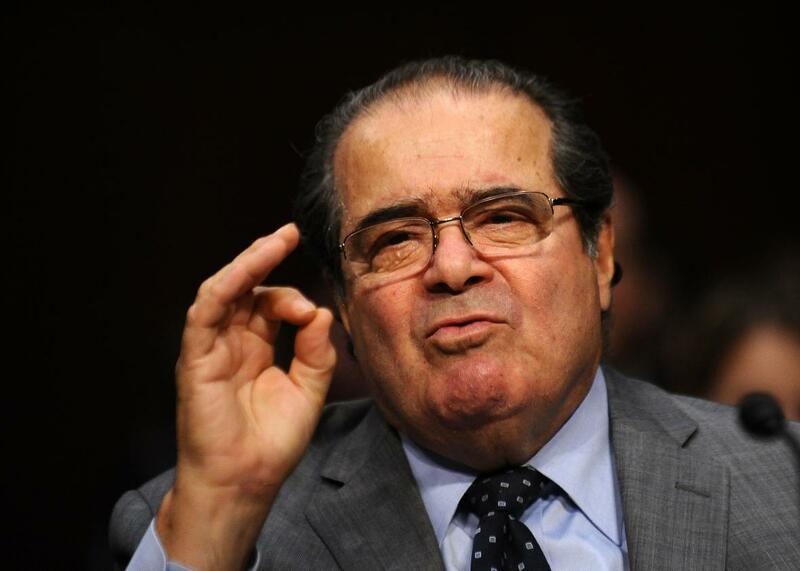 Prisoners, women, gays, minorities, workers, and living constitutionalism lost a great intellectual foe on Saturday. And in the coming months we may be witness to one of the nastiest constitutional battles in a generation. But for now, I am still trying to absorb the fact that a man who seemed like he would live, and love, and scoff, and snort forever was not immortal. And that as reprehensible as so many of his views were, we will be wrestling with him for decades to come. Asked for his reflections on Bush v. Gore, the justice was fond of saying, “Get over it.” We will not get over Scalia for a long, long time.